Its been a while since I last posted any of my work. This is sue to making five of the Peterbilt trucks with differing trailers. Ill get round to posting them when I can.. This though is a New Holland T8 Tractor. 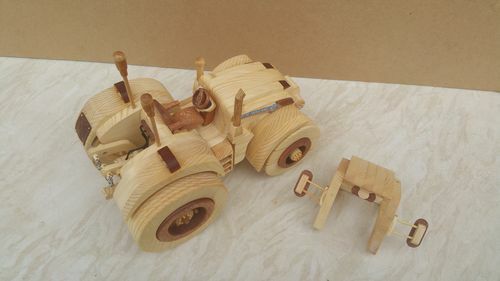 I was approached via my page on a social networking site and asked if I made tractors. I showed them the ones I had plans for and they were too old fashioned for what they wanted. However they showed me a 3d rendered image of the above tractor and of course it was just the basic version, no bells or whistles. It turned out the plan for this tractor was on an international selling page for a very reasonable price. So anyway I set too. The build was rather easy, the main body being split into 1/2” slices. However to maintain lines and consistency I chose to keep the very middle sections as a 1” piece and work outwards in 1/2” slices. The wheels needed further information.. the general premise of the plan makers being that most people purchasing these plans would buy them externally from another site. However I don’t like to do that so I emailed the company asking for further information, measurements etc within half an hour the director of the company had mailed me back with all the relevant info. Great service. This is the first time I’ve made wheels in this way.. and it was a learning curve. The centre part is cut using a 3” hole saw.. the polo shaped wheel is then placed over some Mahogany and the inner circle drawn on. 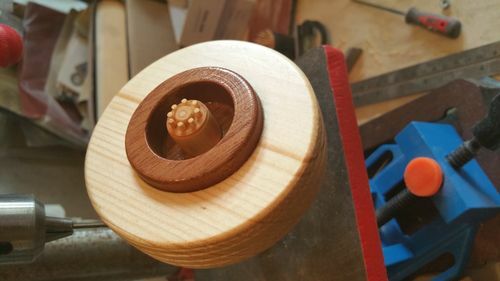 Ive recently received as a birthday gift a desktop sanding station and simply used the sanding disc to sand to the line until it fitted snugly inside the freshly cut hole. Using a 2” forstner bit I then bored out the inner part of the wheel. 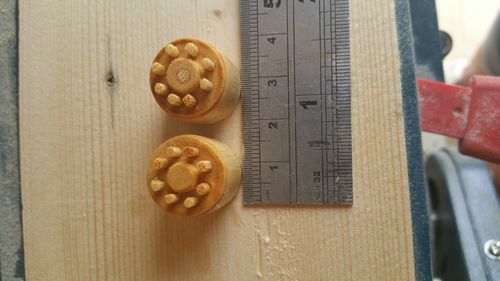 Using a mini lathe I recently purchased I fashioned some hubs.. The PTO was fashioned in the same way.. The steps and steering wheel were somewhat difficult to do. 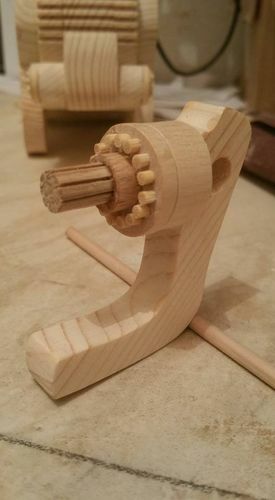 I don’t use my scroll saw as much as I perhaps should.. but with patience I managed it and the results are pleasing..
overall I’ve enjoyed this build. Its been given two coats of Danish oil and only needs a couple of coats of polyurethane varnish with a light 1000 grit light sanding between coats. So very fine work. 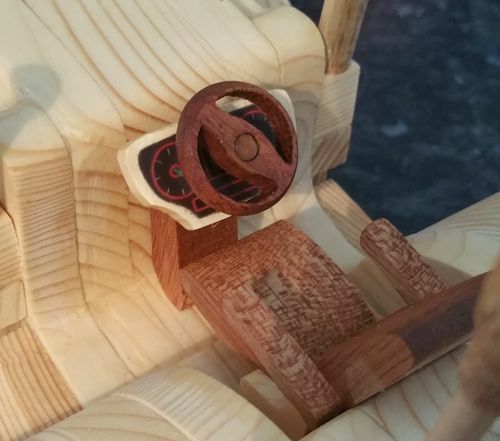 I really appreciate that you made a real looking steering wheel. So many of these I have looked at, so much attention is paid attention to detail, but will just has a disc of some sort for a steering wheel… Great job. Love the modern tractor style. Nice take on a build from scratch. A for A bloody good job. Love the PTO… Now that I know what it is (other than look on the other side)...! PS. Sorry but I can’t handle the ”New Holland” on paper. If you feel the same, I could design a logo for laser engraving/cuttiing if you PM me with the details. Unfortunately, me creating it would not be an issue, but the postage could be a killer. Move to Aus. and I’ll deliver it! 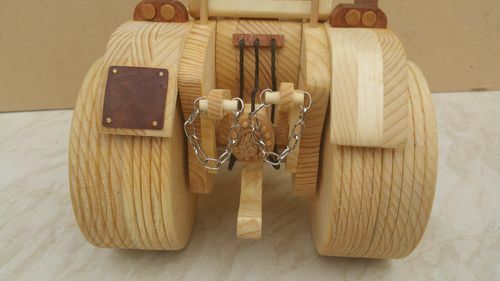 Superb detail and thanks for the explanation on making the wheel. It is a quick disconnect arrangment with pins which go through sperical bearings and held in place by lock pins. The three-point hitch is a widely used type of hitch for attaching ploughs and other implements to an agricultural or industrial tractor. The three points resemble either a triangle, or the letter A. Three-point attachment is the simplest and the only statically determinate way of joining two bodies in engineering. A three-point hitch attaches the implement to the tractor so that the orientation of the implement is fixed with respect to the tractor and the arm position of the hitch. The tractor carries some or all of the weight of the implement. The other main mechanism for attaching a load is through a drawbar, a single point, pivoting attachment where the implement or trailer is not in a fixed position with respect to the tractor. The primary benefit of the three-point hitch system is to transfer the weight and resistance of an implement to the drive wheels of the tractor. This gives the tractor more usable traction than it would otherwise have, given the same power, weight, and fuel consumption. Much the same as a real wheel drive power train. Any attachment that uses rotational power to operate. One of the most interesting aspects of a PTO is the fact you can park up the tractor, leave it running, and engage the PTO without the tractor moving for instance pumping water out of Hancocks holdings ponds across McDonald way and into Watson Park. There is also a drawbar available do you want to know about it too? Wow! This is a wonderful tractor model. There are a lot of great details and craftsmanship that went into this piece. That’s some crazy detail you have in this model. Well done! Very nice well done impressive model. I absolutely love everything about this tractor, up to and including the PTO and 3-point hitch!!! Nice highly detailed New Holland tractor!